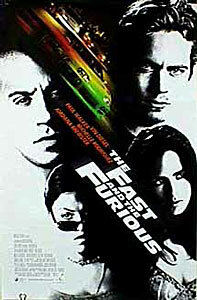 The Fast and the Furious is an action movie set in the world of illegal street racing. Instead of Formula One, NASCAR or Indy Cars, these races feature customized import automobiles equipped with such features as nitrous oxide tanks for extra speed boosts. 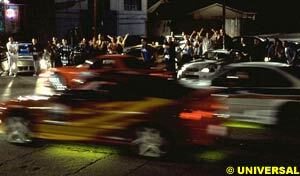 Street racing is a real phenomenon that occurs in cities across the United States. Teenagers obtain used cars and spruce them up with expensive modifications, then attempt to hold high speed races on public roads without police detection. 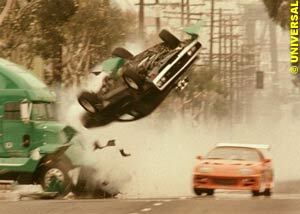 Director Rob Cohen chose to focus on this unorthodox method of racing because of the opportunities it offered for social commentary. He hopes the film's statement brings mainstream success to some of the talent in real life street racing cultures. "These kids come from every race and their only common language is racing," Cohen said. "If you're going to build a car like any one of these cars, you're not in a gang, you're not doing drugs, you're not drinking, you're not doing anything but figuring out how you can earn the money so you can buy an HMK intercooler and make your car go five miles an hour faster. "Do you know how much knowledge it takes to make one of those [cars]? This is the only way a 17-year-old kid can take his mother's used Civic and turn it into a racing machine with wrench time ingenuity and some parts. They can't afford a Porsche and they're not going to get a NASCAR and they're not going to get a Formula One, but if they have an interest in speed, they can make their mom's Civic into a very, very speedy little car and a beautiful car. "You're not going to stop that, so you might as well use the energy and put it right back into society, because somewhere there is a kid who is going to figure out how to make a fuel injection engine do 90 miles per gallon. Somewhere there's a genius who's going to be drawn into this world and is going to figure out something that's going to change automotive engineering. You take kids who can rejigger a fuel injection engine, who know more about cars than they do in Detroit, take that kid and get him into MIT instead of trying to bust him with a $1,000 ticket or impound his car. Cops need to leave street racing alone and use the creative energies of these kids instead." To ensure authenticity in his depiction of the custom import racing circuit, Cohen enlisted National Import Racing Association (NIRA) head Craig Lieberman to serve as the film's technical advisor. Lieberman's services ranged from monitoring the dialogue for technical authenticity to recruiting vehicles and auto parts for the film, and he was sensitive to the inaccuracies perpetuated by some other recent racing movies. "I have not seen Driven, but I saw the trailers and that was enough for me," Lieberman complained. "There were so many things wrong that I spotted in the commercial, I was out. Two things off the top of my head: Indy Cars don't have starters. There's a remote device that starts the motor from the back. Number two, when an Indy Car driver sits in the Indy Car, you can't see his head in any way, shape or form. He's tucked so far behind the safety devices, his head isn't popping up from the sills. Those two things alone in the first ten seconds of the commercial, I realized it was a Hollywood drama. "Gone in 60 Seconds lost me after the Porsche and Honda Civic race. I was done right there. For starters, I haven't seen a Honda Civic dressed like that, that could run with a Porsche. Number two, I've never seen a 38 year old white guy in a Honda Civic suped up like that, so those were two cardinal sins that pretty much killed them with the import car community right off the bat." To Lieberman, the custom import racing world offers more excitement than traditional race circuits. "You look at Formula One, there's only four cars in the lead lap at the end of the race. Everyone else is 1-2 lap down. That's not exciting. I can't get into NASCAR. It's the same ten guys going around in a circle 250 times. That just doesn't excite me. I'm sure it's very challenging and you have to be an athlete, but from a spectator's perspective it doesn't excite me." With the technical aspects in place, Cohen set out to employ new cinematic techniques to capture the aesthetics of speed in the racing scenes. To fulfill Cohen's vision, stunt coordinator and second unit director Mic Rodgers created the self-named Mic Rig, an elongated van with a flatbed low enough that the car could rest on it and appear to be driving on the road. "There was no way to get that speed on film technically through traditional methods," Cohen explained. "You cannot tow a car 175 miles an hour. So, Mic had an idea. If you use a shot maker or any kind of insert car, you're going to be driven by a teamster, you're going to maybe get to 40 to 50 miles an hour. But if he built this Mic Rig the way he sketched it out to me, a stunt driver would drive up front, the rice rocket body would be in the back and that's all there would be. Not rails and all this other crap that's on an insert car. And then we could get up to speeds 80, 90 even sometimes 100 miles an hour and the actor would be behind the wheel looking like they're driving but totally safe. That's what we did. We invented that piece of equipment. It's now being used on Matrix 2 and 3 and it was a wonderful gambit we took to spend the money, to build a new piece of equipment because it wasn't cheap, especially on our budget." Cohen also employed digital effects to give the audience a subjective view of racing that pure camerawork would not achieve. In one scene, the camera appears to go through the engine of a car during a race. "We took apart an RX7 engine, we scanned in all the different aspects of the engine, then we began to animate each part," Cohen explains. "Then I began to condense the flow and the speed and the ramping of the thing and that is actually a tour through an engine. That is an accurate 100% true tour. If you were a gas flying through the car, that's what you would see." Cohen also sent the actors to the Grand Prix racing school in Las Vegas so that they could convincingly portray experienced racers. 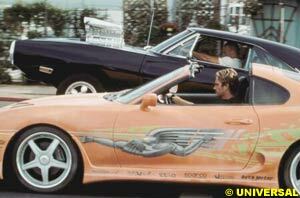 Star Paul Walker, who considered himself an experienced car enthusiast, found he had a lot to learn from the pros. "They taught me that I really didn't know a damn thing about driving even though I thought I knew everything," Walker admitted. "They taught you how to take corners, how to come in, like the approach. You don't want to come in too steep. You want to come at a lower angle and then exit high. They talked to you about the apex where you want to exit. This is all racing jargon, stuff that people really don't need to be familiar with unless you go to race car driving school." Jordana Brewster plays Walker's love interest in the film. She participated in reflex-developing exercises at the school and also had a chance to learn from some street racers who appear in the film. "You have to speed on this race track at least 80 miles an hour and it was really short," Brewster recalled. "Then there were three lights and two of them turned red and one of them turned green and at the last minute they would change the light so that you'd have to go into the one lane that was green, just to test your reflexes. A lot of the extras on the set brought their own cars, so I got to talk to them a lot. I learned how much skill it takes and I think a lot of people are like, 'Oh, they like to go fast and that's it.' But they spoke about their cars like it was their baby, and just how much they invest in them and how smart they are. No one could understand half of the technical jargon they were throwing around like it was second nature." Rick Yune, the film's villain, added his thoughts on the racing experience. "When you're driving on the street and driving on a track it's entirely different, because you're dealing with angles and apexes and things like that. So, you're going on a straightaway and then you have to hit the curve just right and curve it so that you're not wasting that amount of space. A few feet can win or lose a race. We were learning about that and going through simulations. It was a great experience. "We had an obstacle where we had to learn how to skid, so you'd hit a corner and have to skid for a certain amount of feet before you had to stop. There were times when everybody was skidding out and almost wrecking, things like that. It's kind of hard because you have to brake at the same time as you turn, so it's hard to explain. It's things that you have to do before you do [the stunt]. You practice before you do it. It's nothing you can explain and it's a tremendous amount of respect. Dale Earnhardt had been around for 30 years and one race took him out, so it shows you exactly how much these guys have to really pay attention and focus. That's what the speed is about."